Health technology assessments may require manufacturers of new technologies to have undertaken an assessment of existing economic evaluations. This can be time-consuming and, if not done systematically, can lead to bias in how a new model is developed and parameterised. We identified 100 unique publications of cost-benefit, cost-effectiveness, cost-utility, cost-consequence or cost-minimisation models. These were indexed according to publication date, disease, subpopulation, jurisdiction and type of exercise therapy, and used to develop the Evidence Map. You can download a free copy of the Evidence Map here. To use the Map, open the workbook in Excel, enable the content and go to the Mapper sheet. 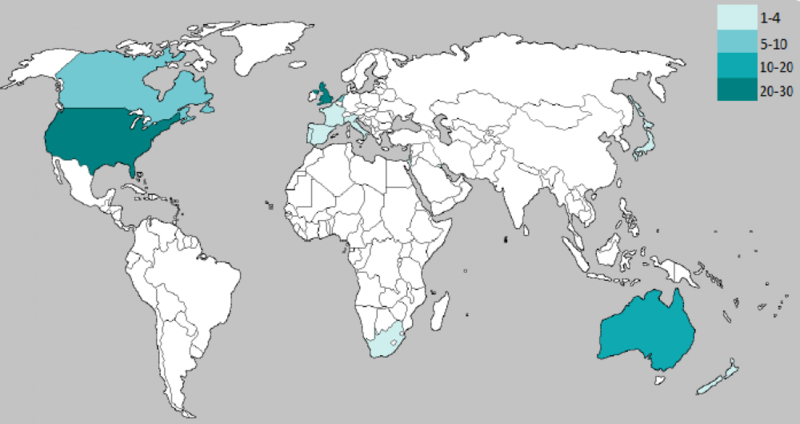 The 100 publications were relevant to 13 jurisdictions. 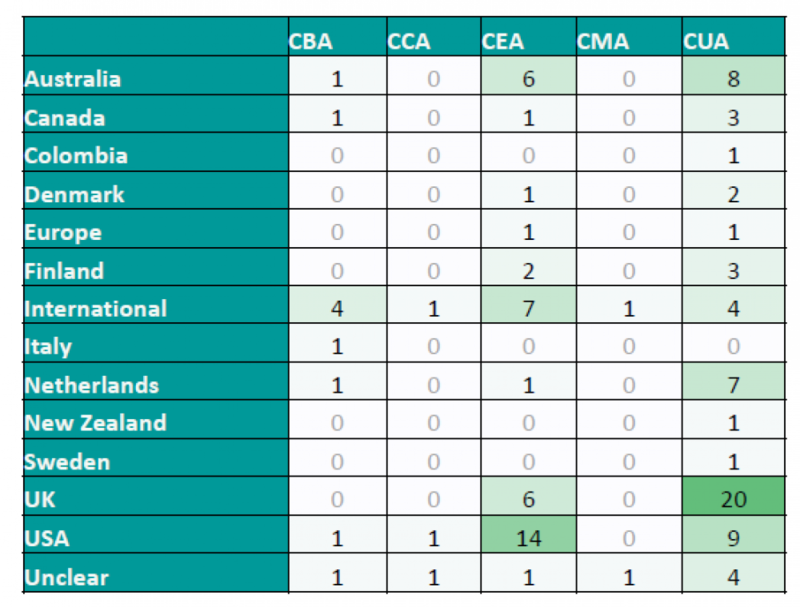 The UK was the most frequent location for the studies (24 abstracts) followed by the USA (23 abstracts), Australia (13 abstracts), the Netherlands (8 abstracts) and Canada (5 abstracts). Most of the evaluations were cost-utility models (63 abstracts), followed by cost-effectiveness (38 abstracts), cost-benefit (10 abstracts), and cost-consequence or cost-minimisation models (5 abstracts). Healthy individuals with no disease were the most popular population (24 abstracts), followed by musculoskeletal disorders (15 abstracts), cardiovascular diseases and cancer (6 abstracts each), and dementia and respiratory disorders (5 abstracts each). 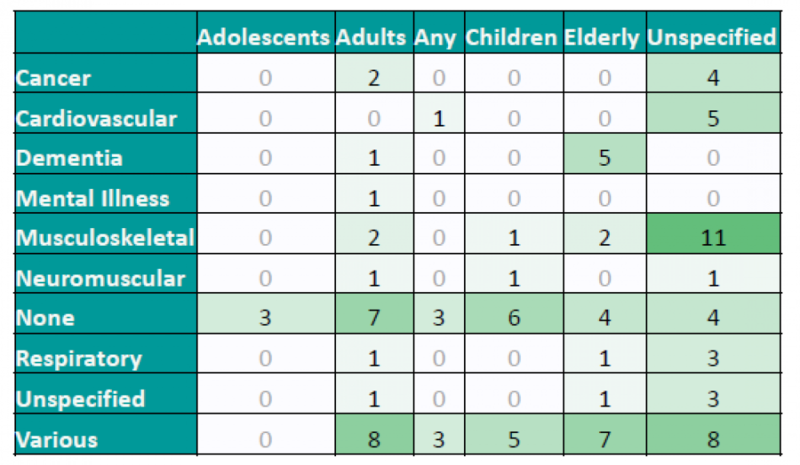 The studies most frequently concerned adults (24 abstracts) and the elderly (20 abstracts). Of the specified activity types, home based training was the most widely modelled (10 abstracts), followed by physiotherapy (5 abstracts), but most studies did not specify the type of exercise. Economic model studies for exercise therapy have most commonly explored home based training methods and focused on healthy individuals, although a large proportion (58%) of the interventions were unspecified. Download a free copy of the Evidence Map here.